Chilli, ají, lup chew, mirich, felfel, bisabas, chilipippurik - these are just a few names for a small fruit that delights people all over the world. Botanists may dispute the chili pepper’s original birthplace, but its amazing journey across the world and adoption by many cultures marks the the chili pepper as a global food. The chili pepper has been with many cultures for so long - moe than 500 years in some cases - that many might be surprised to discover that its origin is South America. Chili peppers are thought to have been eaten in Meso-America as early as 5000 BCE. Archaeologists have estimated that humans began farming chili peppers between 5000 BCE and 3400 BCE, making them one of the oldest cultivated crops. Confusing the chili pepper with the pepper he had hoped to find in India, explorer Christopher Columbus named it pimiento, Spanish for pepper. Chili pepper has no relation to the black pepper, Piper nigrum, searched by Columbus. He later brought the chili pepper back to Spain, calling it a spice even though it’s a member of the Solanacenae family, which also includes tomatoes, potatoes and tobacco. The Portuguese appear to be the first traders to have spread the chili pepper globally. Portugal’s maritime power - rounding the Cape of Good Hope and reaching India in 1498 - set a course for the chili pepper to leave South America. The Treaty of Tordesillas in 1494 was supposed to split the world in half between Spain and Portugal, and the Portuguese were keen to exploit their half. By the 1500s they were regularly exporting chili peppers from Brazil. One botanist of the 16th century referred to chili peppers from Goa, in the Indian Ocean, as “Pernambuco Peppers,” named after the area in Brazil. During their trips to India, Portuguese traders stopped in various African ports along the way. The Africans were fond of “grains of paradise” with a gingery, peppery taste, and they absorbed the piquant chili pepper into their cuisine with ease. It didn’t take long for chili peppers to travel eastward to Mozambique. But trade was only one agent of the chili pepper’s spread: Portuguese intervention in Africa also played a large part. The Portuguese enslaved Africans from diverse locations to populate their plantations in the New World and separated family members - a strategy intended to reduce chance of rebellion since the slaves would lack a common language and culture. Portuguese slave traders traveled the continent and dispersed chili peppers along the way. Less is known about the chili pepper’s travels across the Pacific. In 1529, the Treaty of Zaragosa defined Spanish and Portuguese jurisdiction in the Asia Pacific region: The Spanish received the Philippines, and Portugal received the Spice Islands, or Molucca. By 1540, the Portuguese were trading in Indonesia; soon after, chili peppers made their way to China. However, it’s unclear if the Portuguese were the first to bring the chili pepper to China. Indians and Arabs were actively trading with the Chinese long before the Europeans arrived. Furthermore, Hunan and Szechuan provinces, with cuisines that make frequent use of chili peppers, were connected to the non-Chinese world by the Silk Road trade route rather than by coastal ports. Moreover, at the time, there were no direct overland routes from Chinese ports to those two provinces. In 1549, the Portuguese reached Japan, but again it’s unclear if they introduced the chili pepper there because the Japanese had already ventured to Mexico in Spanish-designed ships. In 1564, the chili pepper reached the Philippines and then moved on to Melanesia and Micronesia along a Spanish-developed trade route. While Africa, India and Asia quickly absorbed the chili pepper, Europe was reluctant to use it as anything more than a curiosity or an ornamental. From Spain, the chili pepper moved to Antwerp, then to Italy in 1526, and on to England in 1548. Curiously, the chili did not reach Eastern Europe through trade with other Europeans. One theory suggests that Muslim merchants brought chili peppers from India through the Persian Gulf, on to Aleppo or Alexandria, and then north into Eastern Europe. Alternatively, the Turks could have brought chili peppers from Asia and then transported them through the Persian Gulf, Asia Minor and the Black Sea into Hungary. From Hungary, the chili pepper then moved to Germany. Another possibility has the Portuguese exporting chili peppers from Hormuz, one of their colonies, to Eastern Europe to compete with black pepper from India. A German botanist in 1542 gives a recipe that calls for “Calicut pepper” and “Indian pepper.” In 1868 Europeans learned that chili peppers were not originally from India. Perhaps most surprising is now long it took for the chili pepper to arrive in North America. Despite being grown in Mexico for centuries, the chili did not appear until the slave trade was well underway. By 1600, the British and Dutch had broken the Spanish and Portuguese naval hegemony, freeing up the spice trade. But trade in spices did not whet the North American palate for hot chili peppers. Instead, the prevalence of chili peppers in African cuisine spurred their spread in the New World. Chili peppers had become such a crucial part of the African diet that slave traders carried large quantities with them on transatlantic voyages and plantations grew them in gardens for kitchen use. Species of chili pepper include capsicum annuum, found primarily in Meso-America, which gives us cayenne, bell, and jalapeño peppers; capsicum frutescens, found in the Amazon basin, yielding the well-known Tabasco; capsicum chinense, found in the western Amazonia region; capsicum baccatum, found only in South America; and capsicum pubescens, in Central America and Mexico. The chili pepper’s global presence owes much to its resilience and capacity to be spread even without human intervention. Birds eat the fruit and deposit the seeds miles away. The flesh of the chili pepper dries well and the seeds survive for long periods, allowing for easy transport. Capsaicin, an alkaloid compound found only in chili peppers, determines the fruit’s heat. While the skin and seeds contain small amounts, the membrane inside contains almost 90 percent of the chili pepper’s capsaicin. The name chili derives from the ancient Aztec dialect of Nahuatl, which called the pepper chiltepin. The chili pepper not only adds a pungent flavor to dishes, it also appears to have analgesic properties. The capsaicin found in chili peppers may release substances within the brain which control pain as well as stimulate feelings of well-being. Capsaicin cream has been shown to reduce arthritis pain and is used as an herbal remedy for other ailments including backaches, varicose veins, vascular conditions, swollen feet and rheumatism. 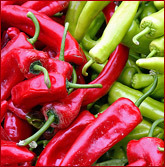 India is the largest consumer and exporter of chili peppers today. Exporting more than 51,000 tons of chili peppers annually, India also exports chili oleoresin, a combination of oil and resin; powder; and crushed chili peppers. In all, India produces close to 8 million tons of dry chili pepper a year. No matter how you prefer to take your chili pepper - whether in Indian curry, mixed with Thai fish sauce, Korean kimchi, Mexican salsa, Hunan kung pao or as a pepperoncino in Italian antipasti - the fruit makes every dish more lively.